Fall can be a very productive time of year to fish. Water temperatures start to come back down and the fish become a bit more active. Boca Grande and Englewood offshore temperatures are already starting to creep below 80 degrees. Inshore Charlotte Harbor, snook and reds are starting to become more plentiful. Target these guys in the morning with your favorite topwater lure of choice. Our favorite topwater is Heddon’s spook one knocker in the bone color. Another good choice is the spook XT because the hooks are a bit sturdier and you are less likely to lose that monster snook. When using topwater lures, you want to utilize the “walk the dog” action. This involves a steady twitch and reel which takes a bit of practice, but once you get it dialed in, it’s game on. All too often we see folks overwork these lures either by twitching too hard or not twitching enough. You want to work the lure hard enough to get it to move side to side to activate the rattle but not so hard that you are pulling it out of the water. One of the most important things to remember is to NOT set the hook. A topwater lure produces violent reaction strikes, so many times the fish will miss the lure on that initial strike. Jerking or setting the hook will pull the lure away from the fish and you will most likely not be able to tease them back. However, if you keep that steady twitch, reel action consistent after the initial strike, you are more likely to receive successive strikes, increasing your hook up ratio. For topwater fishing, I prefer to use a 7’ rod with a 3000 or 4000 reel spooled up with 15lb braid and 30lb fluorocarbon. Always tie a loop knot to the lure to allow for even more action. The trout bite has still been consistent and we’ve been catching them on topwater, live bait and other lures of choice such as Mirrolures’s mirrodine. For those that prefer live bait, I like to use a Bomber popping cork with about a 3’ flouro leader to target trout or a free lined white bait on a 5 or 6 ott hook to target snook and reds. As fall approaches, be on the lookout for those massive schools of redfish. You’ll find them up in the flats foraging for food and eating everything in sight. These schools are very easy to spot and have a tendency to stay in the same areas for several days moving with the tides. So if you find them in a specific area today, check that area tomorrow during the similar tide. When you do find them, use your trolling motor to get ahead of the school so you have more time and better opportunity for bait placement. The snapper and grouper bite has been great as well. Find a good patch of hard bottom, mark fish on your machine, and make a few test drops before deciding to anchor. Once you find a good number of fish, cut up that bonita you caught on the way out into large 6” triangular strips and send that to the bottom. I like to use a 3’ length of 50lb fluorocarbon leader with a 7 to 8ott circle hook with anywhere from 3 to 6oz of lead. Once the lead hits the bottom, reel up a crank or two so the lead is not getting snagged and you have a head start on getting that monster off the ocean floor. We pulled in several 27”+ red grouper using this tactic on our last trip out. While waiting for that big guy, drop a ¼ or ½ oz jighead with cutbait or livebait hooked through the mouth to target snapper. Remember to grab a couple bags of ice to toss in that Pelican cooler so you can keep your catch iced, fresh and ready for dinner. Another reminder is to wear sun protective clothing and sunscreen where skin is exposed. Remember to reapply after swimming or diving. Our favorite brand of sun protective clothing is Huk. They are the top of the line and most stylish fishing shirt on the market. Hats, visors, and gaiters are also available with a multitude of color and style selections. 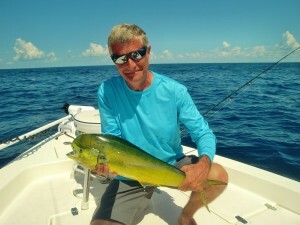 So if you’re ready to get out and catch some fish, feel free to give us a call at 941-698-0323.